I learned how to make a boeuf bourguignon recipe long before I knew anything about its history. This traditional French recipe originated as a peasant dish. Much like our stew recipes, it started out as a way of using cheap cuts of meat. The cheaper cuts are usually much tougher requiring longer cooking time to tenderize the meat. There is one distinctive difference between the boeuf bourguignon recipe and our stew. Boeuf bourguignon originated in the Burgundy part of France therefore the recipes contain Burgundy wine in them. (I am not against adding Burgundy to any of my stews. What great flavor it makes!) Originally bacon or bacon fat was added for extra flavor. Sometimes I do add bacon also to my American recipes. The French learn how to make boeuf bourguignon recipe which has remained in the French cuisine over the years. It is now considered much more than a peasant dish. With the addition of many gourmet ingredients like various mushrooms, it has become a favorite to many connoisseurs. In a heavy cast iron skillet, sauté chopped onion in a little oil until golden; remove from pan. Brown meat a little at a time in skillet (add oil as needed). When all meat is browned, return onions and meat to pan. Sprinkle meat mixture with flour and slowly cook for 5 minutes stirring to prevent sticking. Add wine, tomato paste, bouillon, bay leaves, garlic powder and all seasonings; stir to mix. Pour mixture into a large casserole dish or roaster pan; cover and bake 3 hours. After 2 ½ hours of cooking, sauté mushrooms in butter and add to meat; add small onions. Stir mixture to blend and finish baking. Remove bay leaves; serve with cooked rice or cooked noodles. This delicious hearty beef stew recipe is a version how I learned to make the boeuf bourguignon recipe and is probably from my German ancestors; the cabbage and potato dumplings recipe gives it away. Brown meat in a small amount of fat in Dutch oven; add onion and garlic and cook until tender. Sprinkle meat mixture with flour and cook a few more minutes while stirring. Add beef broth, celery, carrots, salt and pepper; add corn, peas, cabbage. Combine egg and bread crumbs; mix well to soften bread crumbs. Add onion, 1 tablespoon flour, salt and pepper; mix well. Stir in potatoes and form into small golf ball size balls; roll in additional flour. Cook in stew until done. 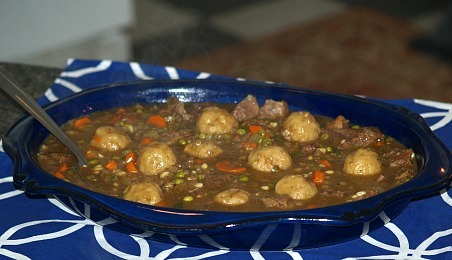 A version of the boeuf bourguignon recipe here in the United States incorporates many vegetables into the recipe. Mix flour and spices together in a small bowl. Cut beef into cubes; dredge meat in flour mixture and brown in hot oil in a large skillet. Add beef broth, wine, bay leaf and 1 can of water; simmer for 1 hour or until meat is tender. Add vegetables and tomatoes and cook another 30 minutes or until vegetables are tender. Heat oil in large skillet; add beef cooking until browned stirring often. Transfer to slow cooker; sprinkle with black pepper. Add wine to skillet and heat to a boil; cook and stir 1 minute scrapping the bits from bottom and sides of skillet. Stir in the mushroom sauce, onions and carrots; pour sauce and vegetable mixture over the beef. Cover and cook on low for 7 hours or on high for 5 hours or until tender. Heat oil in a heavy skillet; cook onions until golden brown and remove from pan. Add beef cubes to the skillet; cook until well browned. Sprinkle beef with flour and seasonings; stir in broth and wine. NOTE: Keep beef partially covered with liquid while cooking; if needed 1 part water to 2 parts wine. Return onions to skillet; add mushrooms and cook 30 minutes. Serve beef bourguignon recipe over cooked rice or noodles; serves 6-8.